Enhance the skills you need to save time, increase productivity or further your career. New Horizons Center for Leadership and Development is designed for all departments and managers. Provide growth for individuals and teams within your organization. 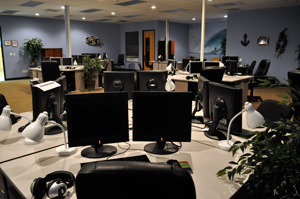 When you're looking for a meeting space or renting a training facility, New Horizons can help. New Horizons has everything you need to provide a high-quality, cost-effective learning or meeting environment. We know what you need for a successful meeting because we do it every day! Whether you are looking for a classroom to deliver your own training programs or a space to host professional, productive company meetings, our classrooms can be configured to meet your specific needs and capacity. Ask us about conference rooms for business meetings or training rooms equipped with computers, high-speed internet access and digital projectors. We can even take away the stress of dealing with technology by providing technical staff to support you with set up and configuration. Establish your skillset using certified vendor approved courses, and earn the certifications you need. Learn beyond the training manuals from top rated instructors with leading industry experience. Industry news, upcoming events, new certifications, tips & tricks, and more. Subscribe for a weekly run down. Our career and corporate training solutions turn ambitions into marketable skills and organizational goals into tangible results for continuous growth. With learning methods for virtually every schedule and style, you can learn what you want, when you want, how you want. Plus the most powerful vendor-authorized learning tools and expert instruction are available to you anywhere, anytime. We've trained over 30 million people to make the most of technology, and we’re just getting started.